What is Republic Day Sale on Flipkart? Flipkart Republic Day Sale is live from 20 -22nd Jan 2019. During Flipkart Republic Day Sale, you get the amazing deals with discount offers on the categories like fashion, clothing, electronics, home & kitchen appliances, mobile and more. You can grab the quick sale deals during Flipkart The Republic Day Sale for every hour. Save more on every product you buy check out the rush hour deals timings. Choose your laptop from low to high performance and price during Flipkart Republic Day Sale. Special discount offers of Rs 10000 is available on laptops for a student. Extra Rs 3000 off is available on an exchange on laptops for students. 4) Don't miss the flash sale that will be for 120 hours and 120 deals. Grab Flipkart Republic Day Sale offers on beauty, baby care and sports product get upto 50-90% off. Get the best deals on the tops brands like Himalaya, Jaguar, Fit Me, Nivea, Gillette, Park Avenue, L'Oreal and more. Check for the Jaw dropping the price on all the mobile deals during Flipkart Republic Day Sale on 20th Jan 2019. Check for other Flipkart mobile offers during Flipkart Republic Day Sale. Get the best price on your old mobile by checking the performance and that too with the exchange offers. Kindly note the exchange offers are available on a working device during Flipkart Republic Day Sale with a hassle-free pickup. Flipkart Republic Day Sale brings exciting new deals & offers on various categories with huge discount. Bring home the latest product at very less price shop from fashion, clothing, mobile, electronics and more from the brand like Samsung, LG, Panasonic, Motorola, Whirpool etc. If you are planning to give a special gift to your sister and brother during any occasion than Flipkart Republic Day Sale is for you. How to Save more during Flipkart Republic Day Sale? Shop for wide categories of products from Flipkart and save more on any categories while shopping from fashion, clothing, electronics, mobile and accessories. Take the loot during Flipkart Republic Day Sale by bringing home new TVs, refrigerator, washing machine, air conditioners, microwaves, kitchen appliances and more. Get the maximum discount during Flipkart Republic Day Sale on the top brands like Samsung, Panasonic, Sony and more. Get coupons and cashback offers on all electronic items with Flipkart Republic Day Sale offers on Zingoy. Bring home all new furniture and household items during Flipkart Republic Day Sale 2019. Flipkart is back once again with money saver deals and offers. Shop from categories like furniture, home furnishing, decor, kitchen, and home improvement items all the products are available at best price from Flipkart shop from more than 30+ lakh products and save upto 40-80%. So every woman in the home can take the benefit of sale by grabbing exciting Flipkart Republic Day Offers. Shop for the favorite beauty products during Flipkart Republic Day Sale offers from the top brands with guaranteed delivery on time. All products available during Flipkart Republic Day Sale are available with cashback from Zingoy. During Flipkart Republic Day Sale shop for high-end devices from the top brands like Samsung, Sony, Nokia, Panasonic and more. Check for the latest arrival of new smartphones during Flipkart Republic Day Sale. All smartphone is available with a huge discount. Send mobile phones and laptops as a surprise gift on your father, mother, sister or brother birthday. Along with Flipkart Republic Day Offers you get the maximum cashback from Zingoy. Get a change during Flipkart Republic Day Sale to grab laptops from the top brands like HP, Lenovo, Asus, Acer, and many others. Get the discount offers on gaming laptops, school laptops, business laptops. All professional laptops during Flipkart Republic Day Sale are available with cashback offers from Zingoy. Sale & Offers covered under the Flipkart Republic Day Sale categories. Grab the opportunity of maximum cashback by selling your unused Flipkart gift card during the Flipkart Republic Day Sale. Take the benefit of this Flipkart Republic Day Sale and bring a smile to the face of other select the gift cards that you want to list under the price range. Get the cashback once the gift card is sold. Get upto 80% off on women's clothing like ethnic wear, western wear, lingerie, sleep & swimwear, fusion wear, combo sets, formal wear, leggings & jeggings, maternity wear, fabrics, accessories, winter & seasonal wear, sports & gym wear with 80% off. Flipkart Republic Day Sale offers on makeup, body and skin care, fragrances, men's grooming, hair care, bath and spa, beauty accessories, combos and kits, eye care, sexual wellness, health care, women's hygiene and more with 60% off. What to expect from Flipkart Republic Day Sale? Flipkart Republic Day Sale 2019 will start from 20th-22nd Jan 2019 bringing lots of exciting offers on fashion, electronics, bags, tv, laptops, clothing & accessories and more. Buy Flipkart gift cards from Zingoy and save more during this Flipkart Republic Day Sale. Shop for clothing, electronic items, home appliances, mobile and accessories, and more using gift card and save more on shopping. Looking to buy laptops during this summer season than Flipkart gives you Flipkart Republic Day Sale. Check out some of the exciting discounts and offers on laptops that you can grab during Flipkart Republic Day Sale. Buy high-performance core i5 laptops from the top brands like Asus, Acer, Lenovo, Apple, Dell and more starting from Rs.40000 only. Get exchange offers upto Rs 10000 on your old laptops. Get upto 30% off on laptops with an extended warranty. Shop for a wide range of Laptops from top brands like HP, Dell, Lenovo, Acer, Apple, Asus, Microsoft, Intel and more. 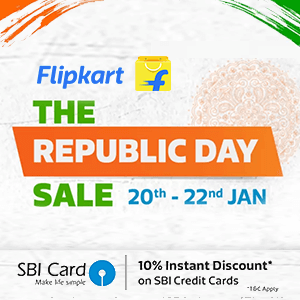 Get an extra 10% instant discount on SBI bank during Flipkart Republic Day Sale. Grab offers on mobiles, computers, tv, appliances, electronics, men's fashion, women's fashion, home, kitchen, beauty, health, grocery, sports, fitness, bags, luggage, toys, baby products, kids fashion, gift cards & more from popular brands during this Flipkart Republic Day Sale 2019. Flipkart plus member can take the benefit of Flipkart Republic Day Offers 4 hours early at 8 PM on 19th Jan 2019. What can Flipkart plus members expect during Flipkart Republic Day Sale offers? Grab super deals on mobiles, laptops, tv, fashion & home during Flipkart Republic Day offers 2019 new offers are updated every 8 hrs. Hurry for rush hours deals discount are available on products till 2PM available only on 20th Jan. Check for special 26 deals during Flipkart Republic Day Sale and get 26% off every day between 2pm-6pm only on sale period. Super saving offers on clothing, fashion, home essentials and more with a huge discount available on every deal during Flipkart Republic Day offers. Grab all the best offers and deals on Flipkart brands like Tv, mixer, diaper, bedsheet, washing machine, clothing, fashion and electronic items at best discount. Shop for latest Marq Tv during Flipkart Republic Day Sale at discount price. Shop for home beautiful furniture and bed sheets from the wide selection at a max discount. Shop for chargers, pen drives, and mobile accessories with low price during Flipkart Republic Day Sale 2019.